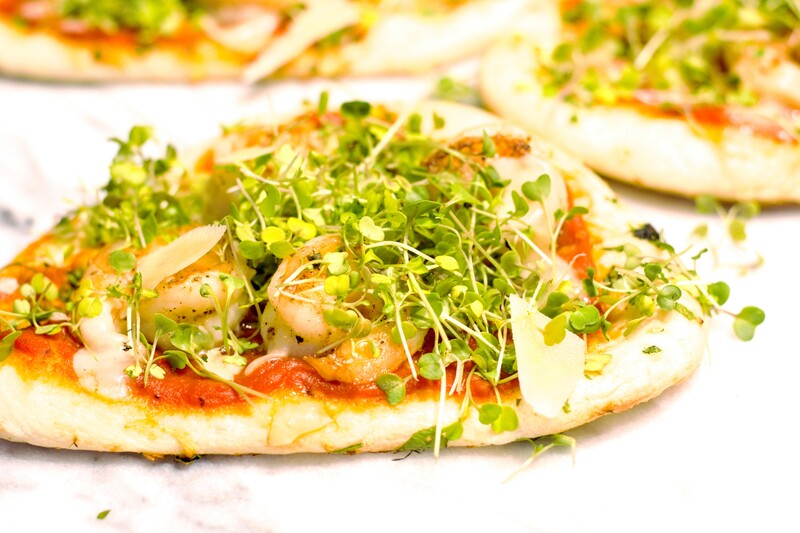 These shrimp flatbreads are made with a few simple ingredients. I used my favorite jarred marinara, sauteed shrimp and shaved parmesan. I topped them with microgreens which I caught on sale for only 1.99! I used Italian microgreens which contain arugula, basil, oregano. This is a quick dinner and reheats well for lunch the next day. Microgreens are immature greens harvested after sprouting. They have a higher nutrient content than their more mature forms. They add great color and flavor to your favorite dishes! Preheat oven to 400° F. In medium skillet over medium heat, heat 1 T of olive oil. Season shrimp with salt, pepper, garlic powder, and onion powder. Sautee shrimp for about 5 minutes until cooked through. Set aside. Put 2 T of marinara sauce on each flatbread and top with 1 T of parmesan and 4-5 shrimp. Bake for 5-7 minutes until cheese is melted and flatbread is crisp. Remove from oven and top with a handful of microgreens and additional parmesan if desired. Serve immediately. This looks yummy!! Can’t wait to try it for my next get together. I’ll the sub the shrimp out with chicken for myself.